Aquaponics - the way of the future? Imagine if you could eat your food right where it is produced, what if the production of food happened in your city? This is where AECOM comes in, they have designed this conceptual cityscape in the face of dwindling resources and diminishing food security. Urban farming is not an new concept and many cities already have residents who create little urban farms in their backyards or even communal gardens tended by a whole community. 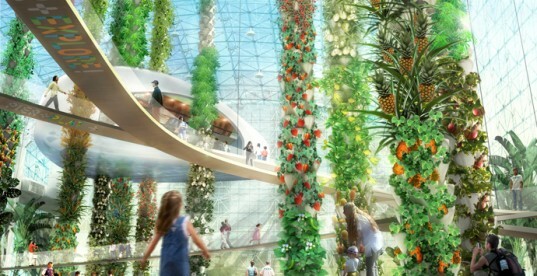 What makes the Urban Food Jungle so innovative is the ambitious idea to include plans for a sustainable food production network that supports local restaurants, and a spectacular center where visitors can view the entire process from farm to table. 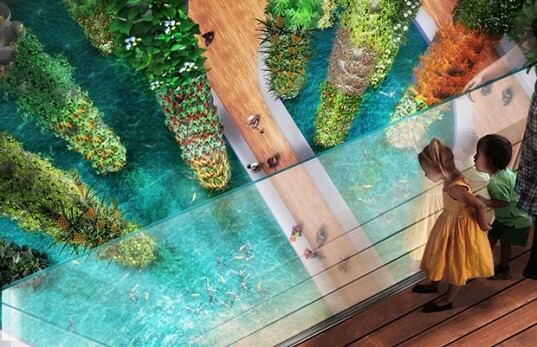 The design incorporates an aquaponic system – a cool futuristic idea where nutrient-rich water from several fish ponds is circulated to the top of several sculptural pillars. These nourished plants would then form part of an edible canopy. Providing easy access for visitors, the design includes a pedestrian walkway where people can observe the entire system. Complete with a “snack shack” and local restaurants supplied by the fruit and vegetables produced on site, the Urban Food jungle is just one piece of the larger puzzle of how to support a growing planetary population with dwindling resources.